Concussion results from an acceleration deceleration injury or a blow to the head hard enough to jostle the brain and make it strike the skull, causing temporary neural dysfunction, but not hard enough to cause a cerebral contusion. Most concussion victims recover within 48 hours. However, complete recovery may take a few months or up to a year. Concussions are classified as mild or classic, based on the degree of symptoms, particularly those of unconsciousness and memory loss. Mild concussion is a temporary neurological dysfunction without loss of consciousness or memory. Classic concussion includes temporary neurological dysfunction with unconsciousness and memory loss. widely accepted theory for concussion is that acceleration deceleration forces cause the injury. 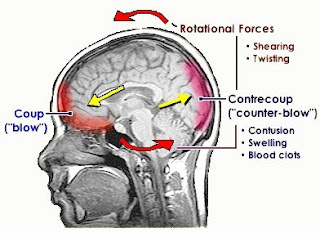 Sudden and rapid acceleration of the head from a position of rest makes the head move in several directions. Brain is, protected by cerebrospinal fluid and cushioned by various brain attachments, moves more slowly than the skull. The lag between skull and brain movement causes stretching of veins connecting the subdural space to the surface of the brain, resulting in minor disruptions of the brain structures. The causes of concussion is usually sudden and forceful for example, a fall to the ground, a motor vehicle accident, or a punch to the head. It's may be the result of an accident or of child, spouse, or elder abuse and sports-related injury. A concussion usually causes no significant anatomic brain injury. Seizures, persistent vomiting, or both may occur. Rarely, a concussion leads to intracranial hemorrhage. Mild cerebral concussions cause headaches, memory loss, dizziness, momentary confusion, residual memory impairment, and retrograde amnesia. There is no loss of consciousness. Classic cerebral concussions cause a loss of consciousness for less than 24 hours, confusion, disorientation, and amnesia upon regaining consciousness. Although these assessment findings can occur on a concussion, it's may also result from a more serious head injury. Medical evaluation is necessary to rule out serious injury to the brain. Skull x-rays, magnetic resonance imaging, (MRI), cerebral spine x-rays. Patient will state and carry out appropriate interactions for pain relief. Patient will express his feelings and fears about the traumatic event. Patient will express that he feels less anxious. Patient will maintain a stable neurologic state. Patient will demonstrate effective coping mechanisms. Patient's fluid volume will remain adequate. Patient will identify factors that increase the potential for injury. Patient will recover or be rehabilitated from physical injuries to the greatest extent possible.